An “emotional peace” stone, white agate clears emotional shock and pain. Soothing nervousness, worry, and difficult feelings, it heals stoicism and the inability to cry. White agate helps in dealing with sudden events and grief. It brings the wearer into the current time, melting away worries about negative future outcomes. 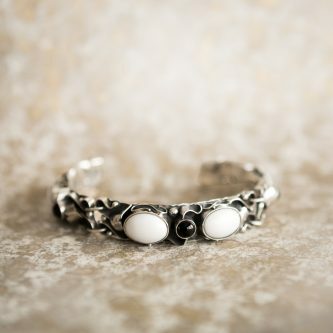 White Agate is very supportive in dealing with overwhelm and stimuli overload, helping the wearer filter out the noise.